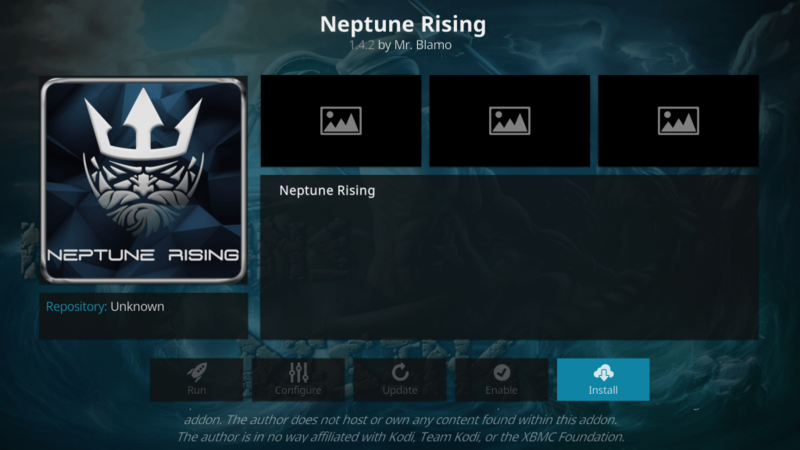 Neptune Rising has become a name to reckon with in the Kodi community. Neptune Rising has dethroned Covenant to become the most widely used and one of the best Kodi Addons. 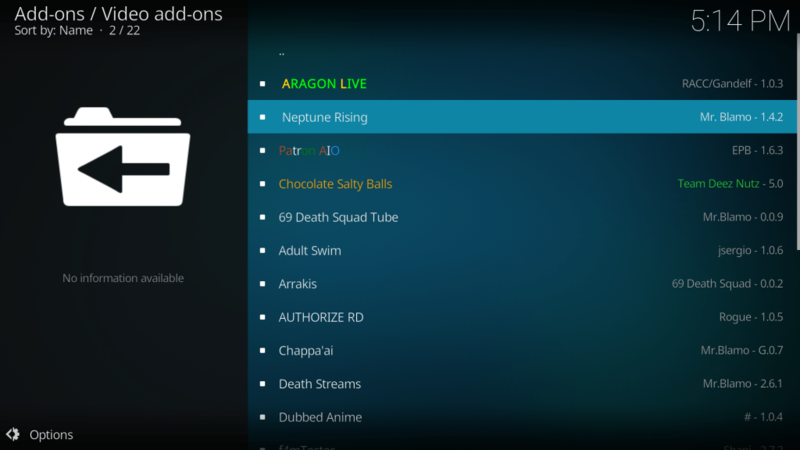 In this tutorial, I will show you how to install Neptune Rising on your Kodi Krypton 17.6 device in some very easy steps. 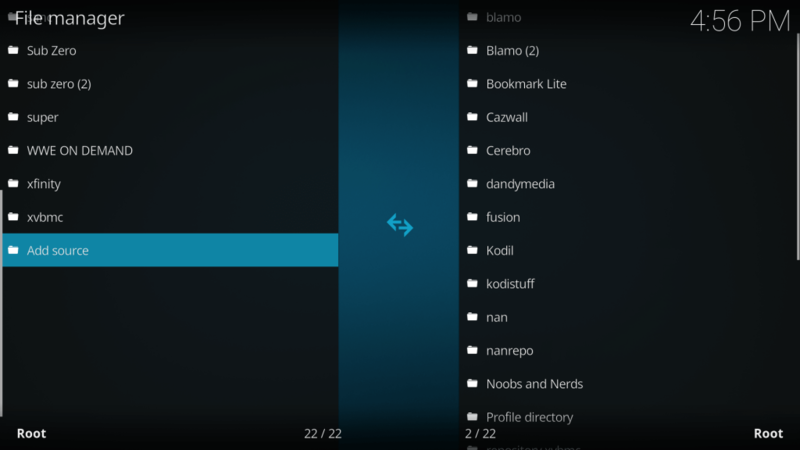 No matter which device you are using, the steps are the same for the Kodi boxes. Neptune Rising was earlier seen as the best alternative to Covenant and Exodus, but over the past few months, it has surpassed Covenant and is probably the most used Kodi add-on right now. Neptune Rising has an extensive collection of Media which hardly disappoints anyone. You name a movie or TV Show, whether new or old, and you will find it here. Apart from movies and shows, you can also watch documentaries, music videos and much more on Neptune Rising for absolutely free. Neptune Rising has an amazingly large number of contributors and thus you will find numerous sources for any particular movie or TV Show, that too in different resolutions. The media library is updated continuously and hence almost all of the links work perfectly well. First and foremost, you need to turn ON installation of add-ons from Unknown Sources. You can do it by simply navigating to Settings > System Settings > Add-ons > Unknown Sources. Turn it ON. If you’ve already done it, you can ignore this step and move ahead to Step 1. 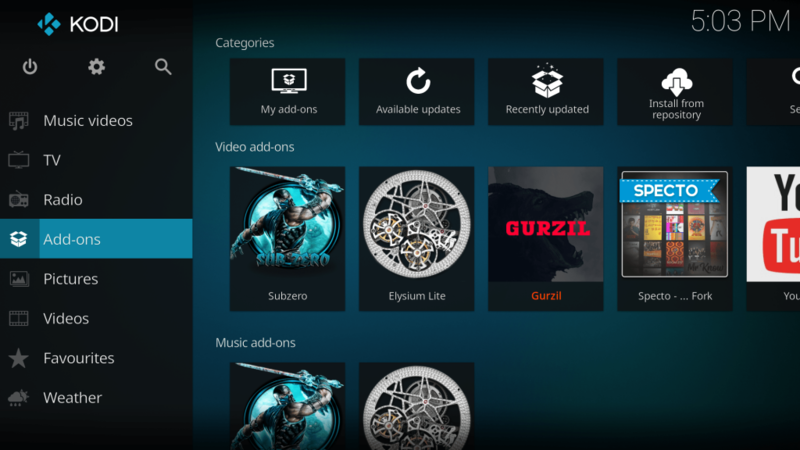 STEP 1: Launch the Kodi Krypton 17.6 Application on your device and click open the Settings menu (the cog icon located on the top-left of the window) as shown in the image below. STEP 2: Now head to File Manager and open it as shown in the image below. STEP 3: Double-click Add Source and open it. STEP 4: As soon as you open Add Source, a pop-up menu will appear. First of all, click None. A new pop-up menu will appear in which you need to fill the Path name (URL for the Repo) and the name of the media source. For path name, type http://repo.mrblamo.xyz/ and click OK. 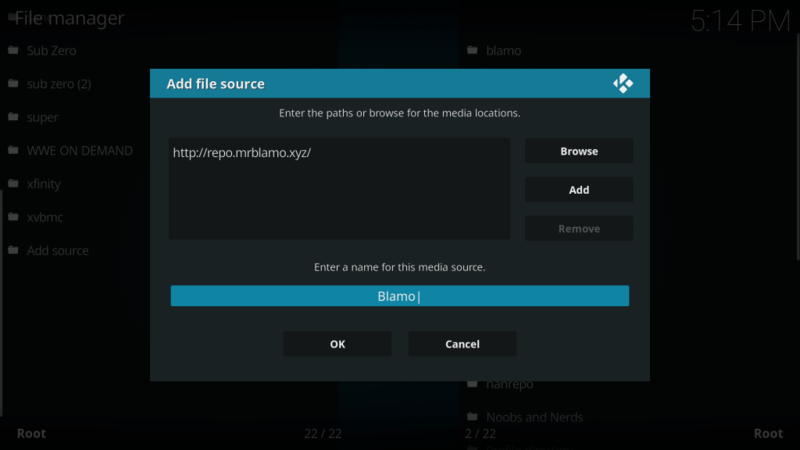 STEP 5: Now type Blamo in the media source name column as shown in the image below. Before clicking OK, please check whether the URL is correct or not. Then only proceed by clicking OK. STEP 6: Once you’ve done this, head to the main menu. You can do so by pressing the backspace key a few times on the PC. Once you’re at the main menu, open the Add-ons menu located on the left sidebar. STEP 7: Now click open Package Installer (it is the open-box icon situated on the top-left of the page). STEP 8: Now select Install from Zip file and open it. 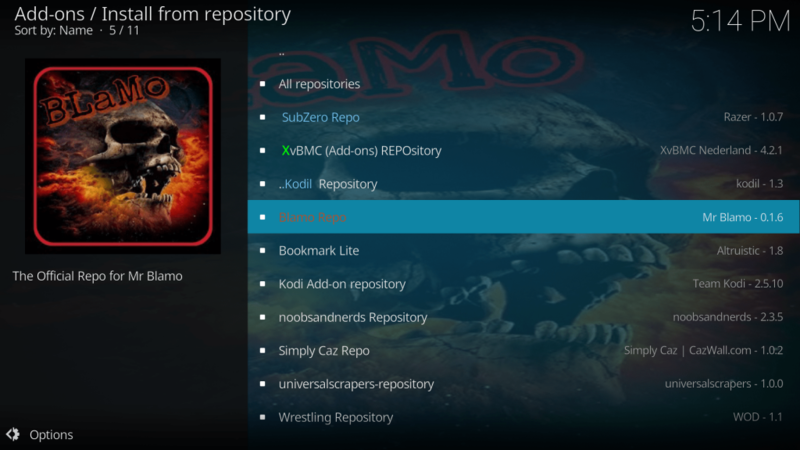 Then select Blamo and then finally select repository.blamo.zip. This will begin the installation of the Blamo Repo and as soon as it gets installed, you will get a notification on the top-right of the window. 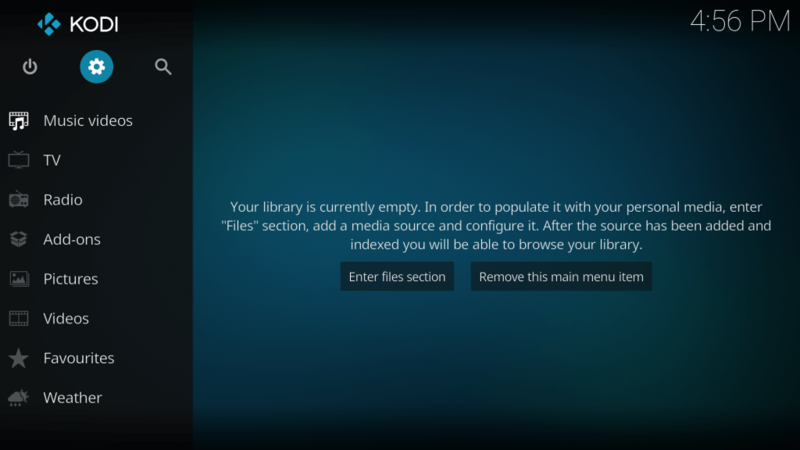 STEP 9: Head to the previous menu and now select Install from the repository and then click open Blamo repository. STEP 10: Once you have opened Blamo repository, head to video add-ons. You will see many video add-ons there, just select Neptune Rising and click open it. STEP 11: Now just click the Install button. Wait for some time and you will get a notification saying “Neptune Rising Add-on installed”. Voila. That was it. Neptune Rising has been now successfully installed on your Kodi Krypton 17.6 and you can enjoy it on all your Kodi devices like PC, Amazon FireStick, Nvidia Shield or other devices. Just sit back and enjoy the vast library of movies, TV Shows and other amazing media content on Neptune Rising. Many users have been currently complaining about issues relating to buffering and the issue of “No Streams Available”. 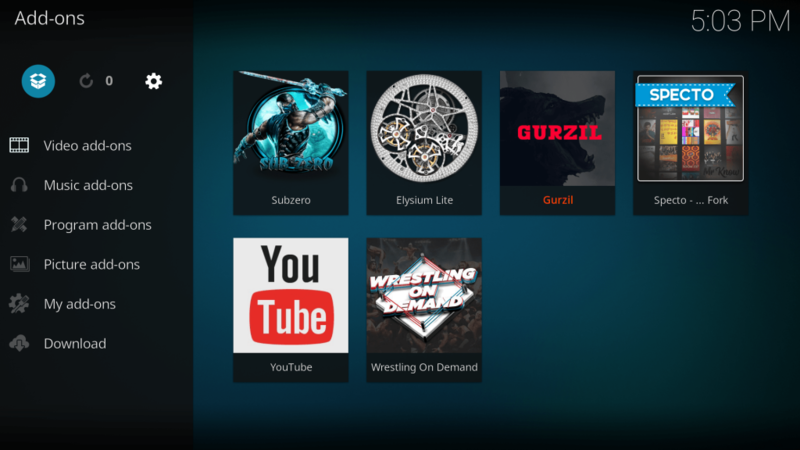 These issues can be simply resolved by getting Real Debrid on your Kodi app. Real Debrid brings loads and loads of working sources in different resolutions thus making streaming far more enjoyable. Another error which is currently plaguing the Kodi users is the Web Request Failed error. Many users often encounter this while playing live streams. This happens when Kodi fails to read the script or file format. You can easily solve this issue by enabling RTMP input. This can be done by navigating to Add-ons menu>My Add-ons> VideoPlayer InputStream>RTMP Input> Enable. I will also suggest you get a good VPN as VPN allows you to watch online content anonymously and even geo-restricted content. Although, I am currently myself using Neptune Rising without any issues, still you face issues with playback, then you can simply clear the cache by going to Tools menu in the Neptune Rising Add-on. 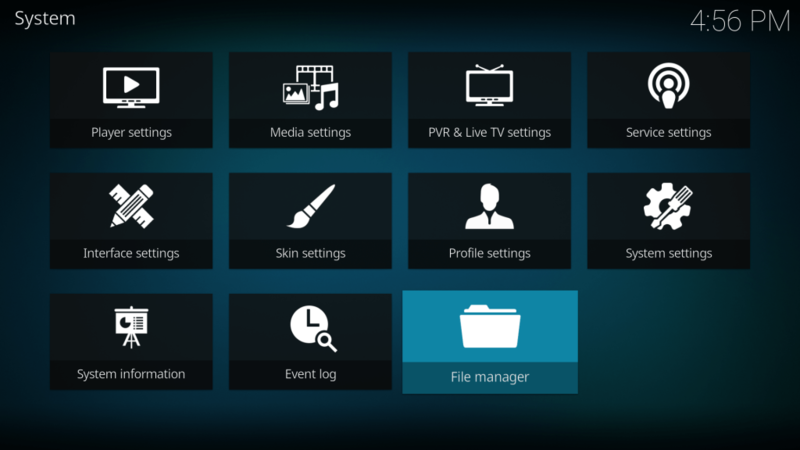 Once you have cleared cache, restart Kodi and try playing the videos again. Clearing Cache often solves the playback issues in most of the cases. Also, please ensure that you are running the latest updated version of Neptune Rising. Regularly checking for updates is a must. Please note that I’ve personally tried and tested this amazing Kodi add-on and as of writing, Neptune Rising has been working perfectly well. 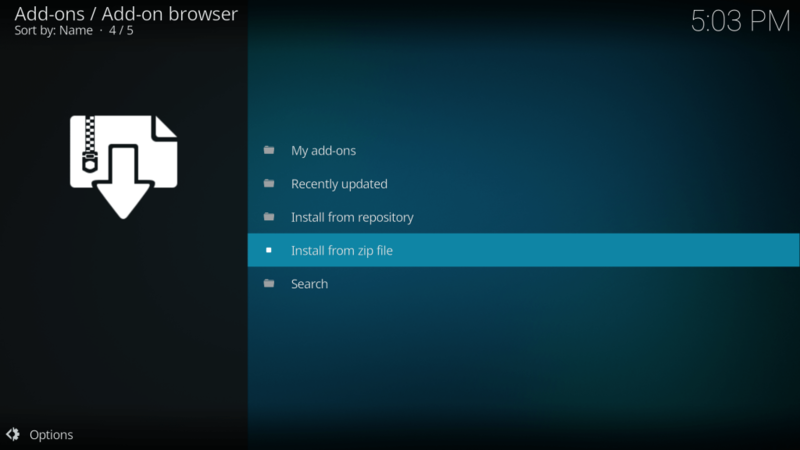 If follow the above-mentioned steps, you can easily install Neptune Rising on your Kodi 17.6 Krypton. However, if you are still facing any issues or are unable to follow any of the above-mentioned steps, just drop your comment in the box below and I will get back to you. Adios.